In every game of Drakon, you must move quickly through the labyrinth, grabbing as much gold as you can, while using all your tricks and guile to keep your opponents from doing the same. An array of different chambers give you the abilities you need to bring yourself gold and backstab your opponents. In addition, each hero features a unique special ability, which can prove to be the difference between victory and defeat. Every hero must be cautious, however. Drakon herself prowls the chambers that make up her labyrinth, taunting the heroes and enjoying the competition she arranged. 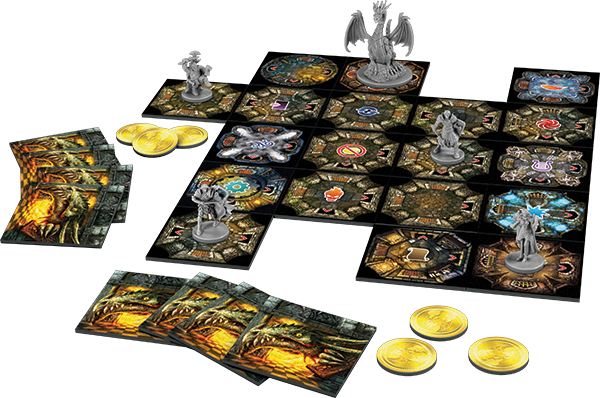 To achieve victory in Drakon, you must be the first player to collect ten gold from the dungeon. There are many ways you may come by this gold though: you may grab a coin from a chamber floor, while another chamber may give you the opportunity to steal your opponents’ hard-earned treasure. Each gold coin has a different gold value, however. A coin may provide one, two, or three gold. At any given time, your gold coins are kept face-down, keeping your opponents from knowing exactly how close you are to winning the game and escaping the labyrinth. If you wish to grab the loot and avoid becoming a snack for Drakon, you must move deeper into the labyrinth. Each turn, you face a crucial choice: move your hero forward and face what lies before you, or add a new chamber to the labyrinth from your hand of tiles. Moving is the predominant way you’ll gain more gold, but new chamber tiles are necessary for building the labyrinth, allowing you to help yourself and hinder your opponents’ quests. The chambers that you play into the dungeon offer plenty of effects, and in most circumstances, the chamber’s ability is triggered when a hero enters. Many chamber effects are beneficial to the hero who enters. You may find a coin among the detritus of the chamber floor, gain a spell of knowledge to steal a tile from your opponent’s hand, or enter a magical teleportation chamber. Other chambers’ effects can prove harmful. You may lose a coin while you attempt to navigate hazardous terrain, and any hero who hears the sounds of the magic harp must move into its chamber, regardless of the danger that lies beyond. 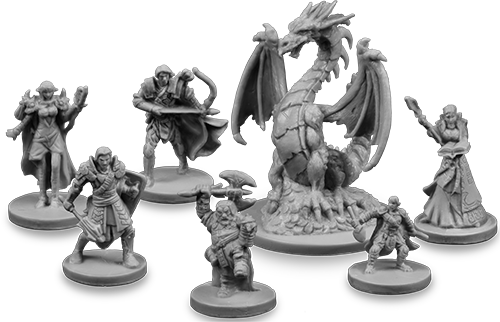 You can play as one of six unique heroes in every game of Drakon: sorceress, ranger, thief, druid, fighter, or knight. 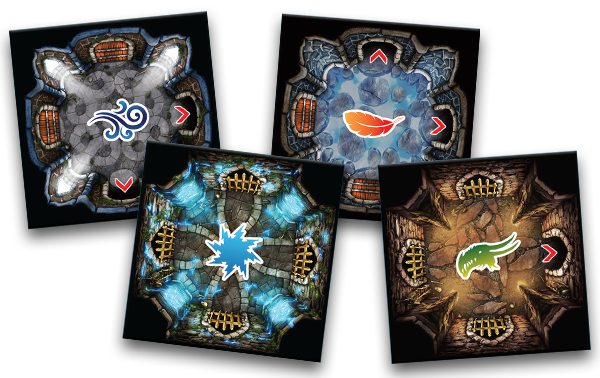 Fortunately for you, every hero offers a unique skill to help you navigate the chambers of the labyrinth and to give you an edge over your opponents. These special abilities can only be used once per game, however, so you must time them carefully. The ranger may put on a burst of speed to outrun another hero to some gold. The druid may use her natural magic to protect her loot from an unfortunate circumstance, keeping her from losing a coin. The sorceress can even walk through a wall to escape from a most dire situation. No matter which hero you play as, you must consider carefully when you will use your talent. Merely avoiding the machinations of your fellow heroes will not be enough, however. A dark terror prowls the chambers of the labyrinth: Drakon herself! But she’s not interested in blood at the moment: she wants to play with her prey. You and your fellow heroes will need to avoid the dragon if you hope to emerge from the labyrinth victorious. Any hero unfortunate enough to cross paths with Drakon is returned to the start of the labyrinth and loses three coins! Drakon is indiscriminate – she taunts all heroes alike – but a clever hero might manipulate her path through the labyrinth, steering the dragon towards his opponents and away from his own objectives. In the heart of the dungeon, treasure awaits, and collecting this gold is the only way you can save yourself from a most gruesome fate. What will you encounter within Drakon’s labyrinth? Whether you find ancient magic, uncountable treasure, or searing dragonfire, you’re sure to experience an unforgettable adventure. Test your wits against the dragon in Drakon! The copyrightable portions of Drakon are © 2015 Fantasy Flight Publishing, Inc. Drakon and Fantasy Flight Supply are trademarks of Fantasy Flight Publishing, Inc.